What is our club philosophy? The club has been established since 2011 and it has quickly evolved. It’s been a constant, fast learning curve, with ups and downs. Thanks to committed members and sponsors we achieved much more than we had ever imagined when the word ‘Agones’ was heard for the first time in the sport scene. 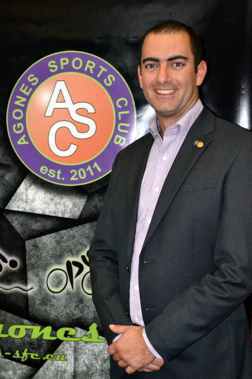 Agones SFC is not just a multisport club, it’s a culture and sport movement, an ideology, a way of life. A brotherhood bonded by the same values and beliefs. As founder and chairperson of the club, I longed for a club that would be different. A club were the most important element is FUN. A club where both newbies and elite athletes sit around the same table and eat the same food. A club where everyone feels at home. A sports club, like any other club, needs to have values and beliefs. One of my first credits at University aimed to explain all the benefits of physical activity. Benefits that I still hold very dear and are also the pillars that should hold the structure of the whole club. When taking tough decisions, these are guided by these pillars and philosophy. While many people start a physical activity program because of long-term benefits, it’s the short-term benefits that keep them motivated to continue with the lifestyle. That is why as part of our club structure we set up committees and events to help every member aim towards a short term goal. It can be either a 5km run or a full distance triathlon. In the past years thanks to fundraising and sponsors we have spent tens of thousands of euros to make sure we have a professional set up and a top notch infrastructure layout to be able to provide the best service possible to all participants taking part in these events. During the past five years the club has flourished. We have seen the club bloom and expand its roots. We are reaching out further and expanding beyond my furthest dreams. Steering such a big movement whilst keep moving forward is not an easy task. It is only thanks to a number of dedicated friends and committee members, as well as helpers, sponsors and club members that we managed to hold all the pieces of this complex puzzle together. This is also why the most important word within the Agonian family must always be ‘RESPECT’. Respect for the members and athletes who sacrifice their time to train to represent the club and respect to committee, sponsors and all those who behind the scenes work hard to make Agones SFC what it is today. That is the philosophy of the Agones Sfc, this has to be the spirit of a true Agonian!